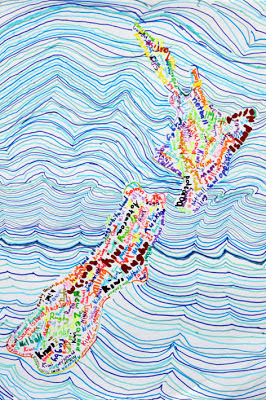 These collaboratively made maps of New Zealand were inspired by American graphic designer and artist, Paula Scher. Year 3 viewed a collection of her beautiful map art here. The land mass of NZ is made up of hand written words all to do with ‘Aotearoa’ (Maori for Land of the Long White Cloud). The children took turns copying from a word bank of around a dozen words with permanent markers. Originally there was a light pencil outline to guide the writing which was later erased. The writing wasn’t particularly legible but the overall effect is great! I really like art that looks great on the wall at a distance but also seems to have laser beams that drag you in for a close-up look. It’s interesting to see all the different writing and words and the ways they zig and zag and tumble over each other. The black and white one is my personal favourite and is inspired by New Zealand’s national sporting colours. 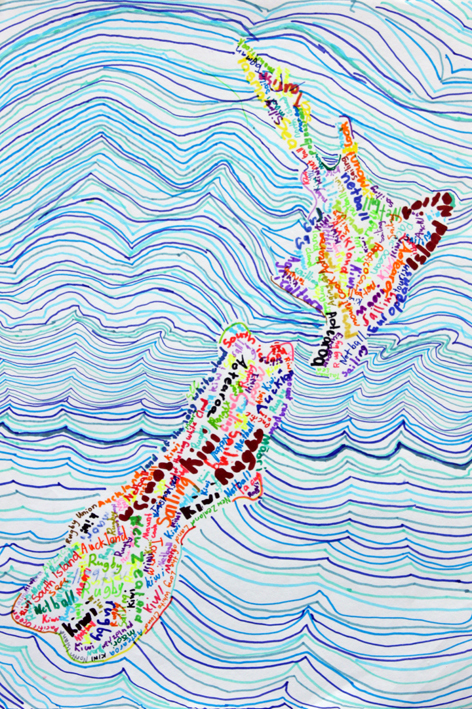 The teacher of this particular class was on leave to compete in a hockey tournament in New Zealand so it seemed like a good opportunity to combine a quick geography lesson with some art. 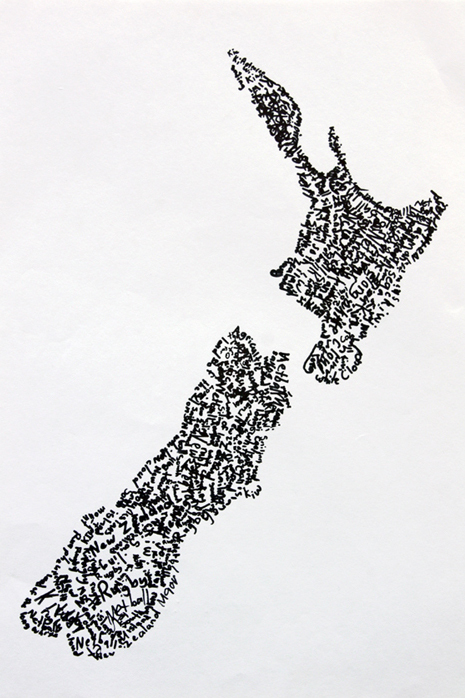 Apologies to any Kiwis reading this who have zoomed in close and feel that our word bank is stereotypical or too limited! In the future I would really like to try this lesson with an older class and let each student choose a country to research and make a Scher-like map of art for. Absolutely no offence taken. This is a great effort. I like the idea of working with older children and a country of their choice. Our children seem so well traveled, they would probably surprise us with their ideas.